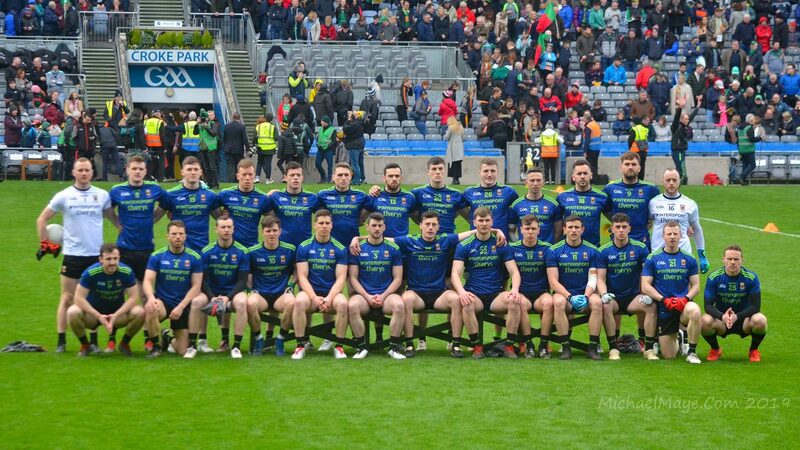 Last night’s win over Kerry was in very much a team effort, with every player putting his shoulder to the wheel in a hardworking display that got its reward in the two-point win the lads came away with. We had several strong performers on the night, chief among them Aidan O’Shea. Lining out at midfield for the first time in ages – although he always operates around the middle, it’s been a long time since he wore a midfielder’s jersey – Aidan put in a barnstorming display. One minute he was back in our half turning over ball, the next he was barrelling forward taking the fight to Kerry’s startled young defenders. It was a cracking performance, one that sees him deservedly voted Man of the Match, with 40% of all votes cast. Aidan was also chosen as MOTM by RTÉ last night and he showed great generosity of spirit by dedicating the award to the late Tom Freeman, father of Alan who sadly passed away inside the last week. Alongside Aidan in midfield last night, his Breaffy clubmate Mattie Ruane put in a huge performance, capped by that great, match-winning goal late on. He comes second in the poll, garnering 30% of votes cast. Kevin McLoughlin, whose defence-splitting pass opened the door for Mattie to bag the goal, comes next on 11%. Well done to them and to all the lads who worked so hard to seal the deal for us last night in Tralee. Fantastic performance. Fully deserved by Aidan. Ruane is a revelation. Mayo football to remain strong with him in the engine room. A truly powerful performance by Aidan and a well-deserved man of the match. It seems like the tougher the conditions the better he likes it. He asserted himself from the off and was not slow in letting those young Kerry guys know who was boss. He never stopped running and his ability to tackle and dispossess a player without fouling is amazing – right now he’s the heartbeat of the team. Most enjoyable win in the league this year. 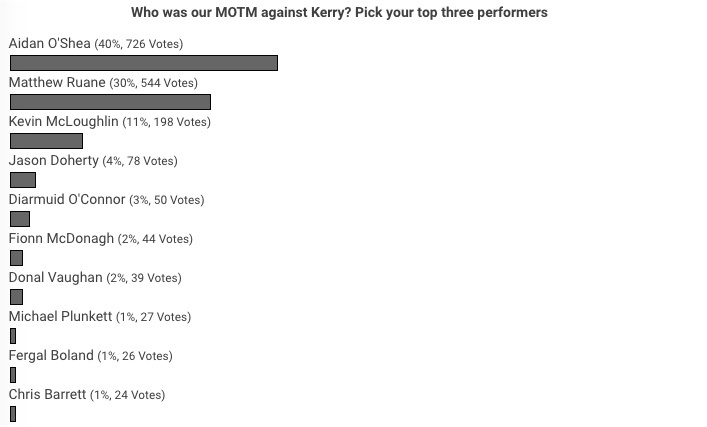 Lovely for AOS to show his Kerry cousins that he is top dog I danced around my living room roaring like a looper. Dessie Dolan is a sad puppy please get him off the telly? Aidan was super on Saturday night but to be honest he’s been one of our most consistent performers for quite some time. He’s the heart of this team and deserves that recognition. One thing strikes me – because he had number nine on his back there was no one moaning that he wasn’t scoring or swinging in and out of full forward. He did his job (as always) and played for the team. People forget it would be very easy for him to pile forward, leading gaps at the back and take pot shots from distance. He never does this and shows a remarkable discipline. He gets dogs abuse most days and rarely reacts. I have to say I have huge time for him and we’d be lost without the man. Well done to Aidan and truly deserved. He was ferocious on Saturday night and such a pleasure to watch. How he never reacts with all the abuse he gets his is beyond me. Well done to Mattie Ruane and Kevin McLoughlin. Kevin is just such a great player and one of our unsung hero’s. I’d love to see him get a well over due All Star this year or even better to get the holy grail!! My view on how and why Aido did so well on Saturday night is that for a change he got a little bit of protection from the ref. Normally opposition players can pull and drag out of him as much as they like with little by way of punishment to them, and barely a free given. On this occasion, Kerry tried that early in the game and they got pulled up on it – that put an end to it and he was able to show what he can do. The bias against Aido and therefore the justification for the vileness that the snakes such as Brolly some of the other county’s “fan” sites come out with is noticeable in the commentary too however. I was sadly stuck watching it on RTE instead of EIR sports, and if ever there was an accusation of a commentator being able to slow down a game it has to be levelled at Dessie Dolan. How that man gets such work is beyond comprehension, even getting work at RTE, where the level of a commentators competence seems to be very much at the “played the game, thats all you need”. He can barely get the players names right and anything he usually has to say is wrong. Case in point, any free Aido gets there was an inference from Dessie that somehow it was soft, or that Aido went looking for it. Can you imagine such accusations continually being levelled at a Dub or a Kerry player?. And our licence fee pays for that???. Whatever you say about paying to watch the game, when that is the quality of commentary that the National Broadcaster it’s worth noting that we pay for RTE’s offering too without having a choice to do so. Aside from that – I thought the game was played in the spirit it should be by both sides, and that the ref did quite well, particularly the conditions the game was played in. Aidan was truly remarkable and a handful for Kerry on Ssturday night. I was on the sideline opposite the main stand when we were attacking the Town goal in the first half and the amount of dragging, hauling, pulling and fouling Aidan off the ball was plain for all to see. Time and time again Aidan was shouting at the Umpire who seemed totally blind to what was going on. The Referee did get some calls right however but Kerry players kept fouling him. This resulted in some dcirsble frees for us especially in the second half.How Aido keeps his cool is beyond me, he is a true Leader of this team. In the second half Kerry had no match for him and Aidan drove the boys forward. He was an Inspiration to all around him. Im sure this rubbed off on Mattie Ruane as well as he is his club mate. Mattie was brilliant as was Kevin Mc especially in the first half. Congratulations to Aidan again and a big Thank you to collective Teams Pride and Skill. I letf Austin Stacks with my son about 6 feet taller! Well done AOS…you were mighty and thoroughly deserved this award! Long may you last…and fair play to Mattie and the rest of the team. It’s lovely to see you bossing a game. On another point altogether I think Jim Gavin has done a super job taking attention off the dubs 5 in a row dream. You even have pundits drooling over the exciting championship we have coming. Dublin don’t like losing but there is method in their league this year…mark my words! My only hope is that they might actually forget how to not lose regardless….if you know what I mean! Mayo Joe. I would class RTE ‘s “analysis” and coverage of Gaelic football as pathetic. They have served as a propaganda machine for certain sides in the past, which as we know too well was very successful. We have seen witch hunts carried out ad nauseum on more than one of our players. If you want to hear your players be personally insulted by snide, bitter people, then tune into the Sunday game. As mentioned above, Dessie Dolan did his best to push the narrative that AOS is sky, tries to win soft frees and “knows how to wind the clock down”. None of that could be further from the truth. As for sky – their analysis is so far ahead of RTE, it makes our national broadcaster look truly amateur in their efforts. Fantastic performance Aiden and well deserved. Should be a 2nd award for keeping calm /controlled against all that abuse. Kevin McL Stephen Coen was super too, as was the whole team performance. Agree with above comments on Dessie Dolan,innenuedos towards Mayo during commentary was cringe stuff and inappropriate. RTE are pathetic. Brolly, Spillane, and O’Rourke all remind me of smart-arsed teachers from 30 years ago making fun of kids in their class. They are just lining their pockets on the back of what is supposed to be a voluntary organisation. I havent watched the Sunday Game since 2014 and i dont know why people do. I normally turn the sound down during games. I dont understand why people dont do that. I got a bill for €160 for licence last week…..yeah RIP OFF!!! What team should we play against Monaghan. On the basis that ALL players on the panel are giving the same commitment to training – surely the lads that have got little game time to date deserve a start. If these lads aren’t picked next Sunday – they might as well leave the panel as when will they get a game? I would start Slingerman. O ‘ Donoghue. Crowe. Drake. McCormack. Plunkett. Gibbons. Boland. Diskin. Coen. Reape. Tracey. What better chance will we get to try out these players before panel is trimmed for championship. Ye are so sensitive to outside sources. I think what Dessie meant is that Aido was using his experience, to make the most of the pushing he was receiving. And why not, if the opposition were stupid enough to keep fouling him.. The manly Meath man was in raptures at Chris Barrett’s diving tackle on Kerry forward – Meath like bravery you know. I nearly spilt my hot chocolate drink, listening to Spillane talking about the fixtures crux. He could not see any reason why Guards on possible 12 hour duty Paddys day, couldn’t play an evening fixture at 7:30 .. I kid you not. On the other hand Kerry supporters have a huge issue wit McStay – and it stems from his pronunciation “Curry”. TBH rte never replaced Enda god rest.. Watched yesterday on RTE, when doherty was taking a free Darragh Maloney said he wasn’t our no 1 freetaker and that David Clarke could be an option to take frees in the second half. You’re probably not wrong Man of Aran but constant sly, sneery, insidious sniping from the commentators is quite constant, and Dessie was very much in such character in looking to assassinate AOS with his invectives. This isn’t new, but its certainly getting boring at this stage. Particularly when we have to pay for it with no choice to do so. that one was quite the stunner too, Just a Thought. Does anyone ever recall David Clarke taking a free for Mayo (or indeed for Stephenites) in the opposition’s half?. I don’t recall him ever taking a free to be honest with you. May have taken the odd one from close to his own goal, but none that I recall. Well-deserved Aido – a masterclass last Saturday night, and as you rightly say Willie Joe, a lovely touch to pay tribute to Tom Freeman. What was wrong with Eirsport Mayo Joe? Had to watch on RTE. Darragh Moloney is ok; I’m forgiving of commentators because they have to actually work and live commentary is not for the faint-hearted. But, Dessie Dolan would put years on anyone, and as for O’Rourke? He’s an absolute dinosaur. The issue is not pro or anti Mayo; these guys have nothing to say. Anytime I see the rival offerings I’m struck by intelligent observations and objective analysis, but no showy, headline-grabbing stuff. Did anybody hear Aaron Kiernan on the podcast, I think he is a bigger mayo fan than any of us here. The best analysts are often on local radio. Billy Fitzpatrick on Mid West and Frank Morris is very good on Galway Bay. TG4 is good in my opinion, I find Aodain McGearailt very knowledgeable and astute about the game. While we are RTE bashing, Martin Carney is terrible, has the uncanny ability to make a brilliant game sound boring. I like RTE and love their progressive approach towards commentary. Why should a knowledge of the game be a hinderence to you analysing the game of football? As long as they achieve equality and balance that’s the main thing. I look forward to the first transgender, agnostic, Somali immigrant on the panel with Pat and Joe. You’ll be waiting a long time for good analysis from RTÉ, sky is miles ahead. Not much left to say but we weren’t the worst team in the world after Galway and we’re not the best now. If Kerry’s final ball was a bit better they could have opened us up but a lot of that was down to Mayos work rate. Doherty and mcloughlins showing for the ball early in the game were vital. They were always out in front of their men. Fionn and Diarmuid worked extremely hard, I was impressed with how mcdonagh stood up physically. I’d prefer to see diarmuid in a more central position where he can effect the game more. Maybe at no.11 for Monaghan. It didn’t really happen for loftus and Durcan, though Boland was much better when he came on. We were fantastic around the middle, like dogs for the ball which is a trait of Horan teams. Also I think plunkett is up there with Ruane and mcdonagh as the find of the league so far. His positional sense is fantastic and hes so positive with his passing. I’d like to see us make a league final, it’s an extra game to experiment before Monaghan. Just the reaction I expected Nothing like a bit of Spillane slashing and Brolly bashing Just proves a polnt you have to be controversial to get notice No mention of boring Whelan or cocky OShea Without being biased I think our own contributers Kevin McStay Lee Keegan and Tom Parsons were excellent As for expert analysis if you can afford to pay Sky Sports 400 euro a year and another 300 to Eir Sport off with you ,the Sunday Game will do me .That is until such time as Sky and other pay per view channels have everything then Midwest and RTE radio will be fine So keep bashing Pat and Joe while you have them. JH’s 15 next Sunday v Monaghan will be of very particular interest, especially our starting 6 up front.I would like to see Brian Reape, Conor Diskin and Darren Coen all get game time along with our top 3 performing forwards in McDonagh , Doherty and McLoughlin. A week a go I would have said we would be better of missing a League Final, now it might be a bonus to guage how the likes of Ruane, McDonagh , Plunkett, Reape and Diskin perform in a big National final in Croker. Mayo Joe no need to pay Sky or Eir sport anything, if you have fairly good Broadband , just buy an Android Box for about 50 euro and you have all Stations free. Re ‘Lundy’ and his “in praise of my Match official’s” … I doubt that the Gooch was feeling the same way, seening as the Gooch got a good smacker into the face, from the same Lundy shortly after coming into the game, it was a blatent Red Card offences, simple as that, .. missed by Ref Mayo’s Jerome Henry and his set of Match official’s. But very difficult for a Match official to pick out in real time, and Gaelic football is notoriously difficult to Ref……..Not that I feel any sympathy for Dr Ctoke’s, who were quite cynical in the Semifinals themselves, and very lucky to have only Buckley send off in the Semi, two more should have been joining him on the sidelines .. But that’s the negative, Corafin were absolutely magnificent, really brilliant brilliant attacking football, quite different approach to the Galway County Team… Probably the best Club Team that have played the game, certainly in my experience…. They indeed are very good in the Galway club Championship, Connacht likewise, but another very good team could possibly beat on a given day…. However in Croke Park, they are absolutely magnificent, unplayable almost. . Congratulations to them on their another very deserved All Ireland success… But that’s where the ‘Galway love in’ finishes I’m afraid, instead I’m beginning to develop a bit of a soft spot for Tyrone, and their New attacking style of football, hopefully it will be good enough to over come the auld “Galway Shawl” next Sunday. .. Good Luck to the Rossies as well, tough assignment to beat the Kingdom , they need to, and of course our good selves need to beat Monaghan…. Could still make the league Final, allot of possible pairings in the league Final… Allot at stake in three of the remaining fixture’s in Div One, with only Cavan V Dublin an effective dead rubber.. TnaG 4, will be spoiled for chioce which of the other three to show, with so much at stake for the other six teams participating… Really Div One of the NFL is a great competition… So it’s Mayo/Monaghan… Tyrone/Galway and Roscommon/Kerry… I’ll be in Mchale Park with thousands of ye like minded Mayo fan’s … Wouldn’t it be just Great to get to see Mayo’ play in good weather for a change, it’s been a while! Has anyone’s Kerry attendance been updated yet ? Only had time to have a half decent peep at the blog this evening. Firstly let me tip my hat to Mayo as they were deserving winners full stop. 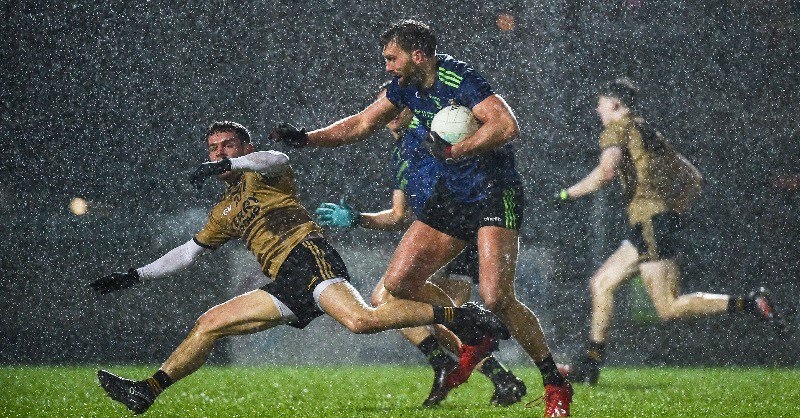 I know it was a shocking evening for football enspecially for the Kingdom faithful, between the wind, rain, hail and Aidan O Shea like a broadsword wielding warrior in mid field cutting us to shreds as we both advanced and retreated. In saying that it is not a game on which reputations will be forged or forgotten. Both teams deserve great praise for the intensity and unyielding effort they displayed Saturday night. In the opening quarter of the game Mayo threw down the gauntlet and set the tone for this one, despite the emerging young talent in Kerry they met an older grizzly team who knew what was required in such conditions. I hope we both make the NL Final as it should be a great game between two teams who feel they have a point to prove, nothing will focus more than a sharp jab to the nose. These young lads will learn plenty from last Saturday night and I feel that it was a very good game for them to have been involved in. Congrats to James and his team on a great performance and win last saturday.Well done to all involved. assignment .You can do it. Km79 my attendance hasn’t been updated yet so far. – Tyrone were back to their usual dirty play with that ‘tackle’ on Paddy Andrews who is reported to have a broken jaw as a result. Andrews is a fine old style no drama type of footballer who I hope makes a a speedy recovery. – It was nearly as bad a ‘tackle as McNulty”s on Leeroy last year. – Late, high, dangerous. Intentional ?? Draw your own conclusions. – A one match suspension or in this case a yellow card is simply not good enough. I get the impression that Dessie Dolan is a nice fella but for a former top class player he misses a hell of a lot in analysis. Diarmaid missed redirecting a long pass into the net by a hare’s breath and he was critical there was no Mayo player in there. His understanding of what is and isn’t a foul is very poor. Many examples of poor analysis, maybe he just gets nervous behind the camera. Some critical of Tomas OS but I find him one of the better ones. Brolly is a joke at this stage, Spillane sometimes right but just too annoying. I’d be happy for O Rourke to be put out to grass too as a member of the 3 stooges. They’re not a patch on Canavan and David Brady can be entertaining (using words like Cajones and finding the macho angle) and finds some good insights too. Watched the first half there again earlier. Didn’t think loftus was as bad as some are making out. He’s got a nice turn of pace and is a silky smooth operator on the ball. Unlucky with a point effort that just dropped short into the wind. Didn’t really happen for James Durcan either but I wouldnt write him off yet. I accept loftus is still a bit timid in the close physical exchanges, but he’s a great option to have in Croke Park with a dry ball and a game that has opened up and become an end to end type game. On the other hand, I wouldn’t really be relying on loftus against the likes of Galway on a tight pitch in castlebar for example. Not suited to that style of game. Apologies to Goagain for taking your name in my first post. Fantastic displays by Aiden, Kevin McL, Ruane, Doherty, Vaughan and Plunkett. The commitment by all the players was excellent. Aiden’s breaking the line tackles was a big factor in our ability to attack Kerry. I think that it might be an interesting experiment to try Colum Boyle in the number 11 for the Monaghan game to give us another option as a line breaker. Colum’s ability to win the breaking ball from midfield would be another positive. One disappointing aspect of our play was that we failed to use the ball when we won some long ball into the full-forward position. It resulted in the ball being passed out again, sometimes as far as the 45 metre line. We should have used the speed of James Durcan, from the corner, to take an offload from the full-forward and use a wrap around to set up a score. The use of space and timing would be essential to carry out this move successfully. Conor Loftus is a talented player, but he needs to dramatically improve his tackling and physicality. If he adds these to his game he could be a vital asset to us in the summer. James Durcan is also a talented player, but he needs to develop methods for getting out of tight situations. All he needs to do is study Kevin McLoughlin’s approach. I think that the Corofin game should be mandatory viewing for any manager. This is potentially the best team Gaelic football ever played. They have produced this level over the last number of years in a fairly consistent manner. When a Corofin player was on the ball, his teammates moved in such a way that he had at least three options to give passes. The slickness of the moves makes me think that they are preplanned and not just a reaction to the play. I hope that we reach the League final. It would be great for our development. @Larry Duff, the horses for courses never rings quite as true as for Loftus. Fine Croke Park player with the game opened up, not suited to Fermanagh in McHale Pk. I’ve given up trying to figure out this Mayo team. Always when you least expect it, they surprise you. Thoroughly enjoyable night in Tralee and as always, a great welcome from the Kerry faithful. The pre-match entertainment was something else. Delighted for Aidan O’Shea, maybe this will shut up some of his detractors (many of them very close to home) for oh, another five days at least. Learned one thing after 2016 and Ciaran Whelan’s unchallenged attack on Lee Keegan. Life is too short for RTÉ and its pathetic excuse for analysis. I’ve watched League Sunday twice so far this year (against my better judgement) and while I wouldn’t be her number one fan, Joanne Cantwell holding those fools to account this year is the only thing worth watching. That, and the hurling section where they actually do attempt to practice the art of analysis. 100% jp, horses for courses re loftus. Could you give a reasonable explanation as to why he didn’t start in newbridge. I just felt it was ideal for him with possibly Andy coming in after a while especially with the heat factored in too. Was sitting beside a lovely Kenmare man on Saturday night. We went through both teams with him telling me details of the younger Kerry lads. He told me that he thought AOS was very overrated. I told him to forget about his size but to look at the amount of work that he does in a game and how good he is at mopping up loose low ball. I asked him after the game what he thought of AOS now. I cant repeat his reply. I found the Kerry supporters very easy to get on with. The night before in ‘The Brogue’ I told the Kerry people that we were having a pint with that I did not think that Kerry could live with our level of physicality. They thought I was mad. Opinions are formed by people looking at TV and relying on what the commentators are saying. If you go to enough matches you are well able to reach your own opinions. Who cares what Brolly or Dessie says? They just say what they think RTE wants them to say. Old boys club. Joanne Cantwell hopefully can change the culture but if she does not who really cares? AOS has come in for some criticism over the past few weeks but to be fair the majority of that criticism was based on his positioning on the field. I feel those criticisms have been vindicated, its no coincidence that AOS delivered his most accomplished performance in ages after been moved to midfield. it is also no coincidence we seen a more varied attack on Saturday night, Aido was just to much of a focal point at CHF. He is a midfielder through and through, its the position where he talents can be best utilised. Im hoping that this will be his regular position from now on. I’ve seen a lot of comments about media bias from RTE and about them being the Dublin propaganda machine. Watching the one o clock news there I found it strange that Paddy Andrews injury was a segment in the sports section. Don’t remember Evan Regans injury sustained against Kerry last year included in the news the following Monday.Maybe there is something to it!!? Derek o Mahony (Tipp) our ref for Sunday. Paddy Andrews injury was included in bulletins because he’s a high profile player, same way Tom Parson’s injury was well covered last year. There was about 5 mins devoted to the Paddy Andrews incident on League Sunday..It warranted at least that.Awful.to watch a player sink like a bag of stones..We would be up in arms if that had happened to one of our own..
One word of caution regarding Monaghan is the influence of Doogan in the midfield area, Aidan certainly will not have the legs to track him for seventy minutes and if he isn’t well marshaled he could cause mayo u told problems. Mathew Ruane would have the legs but I don’t know enough about his instincts to neutralize an attacking player like Doogan, he or whoever is chosen to take him on will have to be open to the possibility of sacrificing their own game for the team. Looking forward to seeing who Horan selects to pickup McManus in this one as it will tell all as regards who he thinks his best man marker is, whoever it is I don’t think they will sleep that well on Saturday night. I expect Monaghan to win this one, simply because they have to. They will go through brick walls to stay up. Us? It’ll depend on the team picked. Suspect James will want to run the eye over a few more newbies (Cathal Horan, Slingerman, Jason Gibbons – not a newbie I know but needs a run, Treacy again, maybe Ryan O’Donoghue if he was anyway fit) and that will be good for them but not necessarily for a balanced team that could beat Monaghan. Just want to to see a competitive Mayo performance with some eye-catching scores from any or all of the above. We’re in bonus territory now. Mchale park was to be a fortress,well lets beat monaghan. Rotation can be done in training from now on. I want to see silver ware. Lets win the f.ing league. We are well able too. ?ive loftus time he will get there. We have the men to mach monaghan and the man with the know how. Plunket must start, what a player. Not sure about boland.great league player,hope he proves me wrong. First time in ages we have a full back that can mix it up the field. No slight on caff but watch how kerry brought out harry but didnt work. I want to see a league final and trust they can win this one.